For our Tap House of the Month we head to the Arts District in Las Vegas. 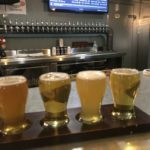 Located on Casino Center Dr., we head into Three Sheets Craft Beer Bar. This great place has 30 rotating taps, so be sure to stop by or check out there menu online often to see whats new. They do offer flights of 4 for people that want to have a little variety or just to find out which ones you like best. 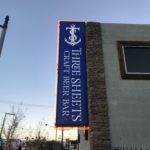 Three Sheets is a two story beer house. Downstairs in the taproom you will find a small bar and five hightop tables. There is a large outside seating area to hold plenty of people. 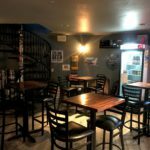 They have an upstairs patio that is always open and on Friday and Saturday, they open their upstairs taproom. This little gem has been open less than a year and hopefully is around a long time to keep beer drinkers happy with new selections all the time.